How Canadian are you? Oh, wait. That’s such a Canadian thing, asking that sort of question, eh? Sorry. But really. How Canadian are you? We all know what that question really means. How different are you from an American? If, for example, you’re from Victoria and you love metalcore and you’re vacationing in Costa Rica, and a guy from Seattle who also loves metalcore is at the same beach in Costa Rica, both of you recovering from the same damp, Pacific North West winter climate, could a German tourist tell you guys apart? Really? Of course, you insist that you can spot an American as soon as he strides into your favorite bar. And you also insist that Americans have no idea you’re a Canadian when you’re visiting south of the border. Unless you tell them you’re one. Which Canadians have a habit of doing. Sorry to remind you guys. That’s the question that lies like a San Andreas fault line underneath our Canadian culture, threatening to disrupt and tumble cherished Canadian cultural institutions like the CBC into the anyone-remember-this dumpster out back behind the store. Did I say San Andreas fault? I meant the Western Quebec Seismic Zone, which lies under the Ottawa Valley heading North West from Montreal up to Temiscaming, Ontario. Sorry. It’s time to do some hard digging in the corners of Canuck culture and scoop up a few facts and myths so we can discover what exactly is genuinely Canadian. What’s True North. What’s Strong and Free. Can we say that? Free? Isn’t that too … American? Sorry. So, here’s 7 Myths about Canada that we like to believe are true. Are they? Let’s find out. An early classic of Canadian children’s television, this sweet show aired from 1958 to 1985. It was about a giant named Friendly and a couple of puppets. Nice and cheap and good for bored, young kids who didn’t know any better. Canadians like me fondly remember that we should have watched the show, instead of Mr. Roger’s Neighborhood, a show we actually watched. But isn’t that so typically Canadian? An overlooked quirky show that some people actually watched. And the rest of us had kind of heard of. There’s a problem, however. The show actually originated as a radio show out West. In Wisconsin. The CBC brought the show to Canada in the late ‘50s and a legend nobody really watched was born. The main actor who helped bring the show to Canada, Bob Homme, was an American who finally took out Canadian citizenship in the early ‘90s a few years after The Friendly Giant’s 27-year run was over. He was even awarded the Order of Canada, and due to his illness, the Governor General went to him to give him the award rather than the traditional ceremony at Rideau Hall. How many Canadians can say that? Was the Friendly Giant 100% Canadian? Nope. 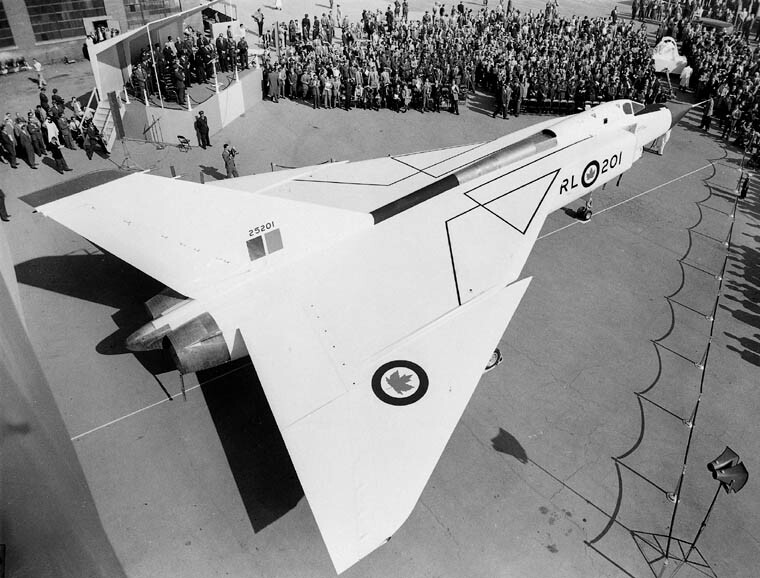 The same year that the Friendly Giant was being born, 1958, the Avro Arrow was being shut down. It was a project focused on developing an advanced military fighter jet for the RCAF. That means Royal Canadian Air Force, in case you needed reminding. This is a part of Canadian history that might seem a little distant and irrelevant to many nowadays, but it was enormously important at the time and it’s still being debated over half a century later. The common belief is that Prime Minister Diefenbaker, who had recently been elected and who would have a turbulent and brief rule with rocky relations with the United States, decided to shut down a hugely promising aerospace program in order to try and mend fences with the military-industrial complex south of the border, so to speak. Not true, according to those who have reviewed the material from the only source that matters: the RCAF. In other words, the RCAF considered the project expensive and unreliable with soaring total costs and worries about maintenance as well as shabby performance metrics – especially the Avro’s ‘radius of action’ which is the distance a fighter plane can fly to fight a battle for a few minutes and then return home to base with just enough fuel left in the tank. Diefenbaker’s cabinet debated the matter for nearly 6 months before deciding to pull the plug in 1958, but they delayed announcing it until early 1959. Further, the order to destroy all program materiel in order to prevent any future government from resurrecting the project actually came from the office of Air Marshall Hugh Campbell, not from the Prime Minister’s Office. Some say that there was information regarding the possibility of a Russian mole working at the Avro plant and that’s why Air Marshall Campbell had all the material destroyed. As we said, the debate over the Arrow still continues. The Avro plant was sold to de Havilland Canada – maker of robust, smaller passenger aircraft well suited to Canada’s great hinterland. Eventually de Havilland was bought out by Bombardier who are now a world-class commercial plane maker with plans to expand to even larger aircraft. Not quite a world-class fighter jet, but something far more profitable and one that creates far more high-paying jobs for Canadians. Did Diefenbaker kill the Arrow to placate Americans? The jury’s still out on this one. Decide for yourself. While Canadians have like to consider ourselves more progressive than Americans with our public healthcare program and our more moderate stances on key issues like guns, economically at least, this is a recent development. In the ‘30s and ‘40s FDR’s government in the U.S. created the New Deal with huge government projects and Social Security, while Mackenzie King’s government in Ottawa was frugal and conservative. The big, sprawling bureaucracies that nowadays manage citizen’s daily lives to an incredible degree were born in Washington DC way before Canada jumped on board that train. FDR had wanted to add a national health-care program to the New Deal in the ‘30s, but the American Medical Association and other stakeholders would always push back hard, so it was left out of the New Deal. Harry Truman’s government were essentially accused of being communists when they tried to revive the idea a decade later in the late ‘40s. By that time, Saskatchewan had introduced public hospital care and Alberta would soon follow suit in 1950. So universal healthcare started as a provincial policy in Canada while national healthcare was more of a federally-driven Washington-based policy in the United States. By 1965, Lyndon Baines Johnson had finally introduced Medicare in the U.S. He was carrying out JFK’s wishes who had pushed hard a few years before to add Medicare to Social Security as a first step towards achieving a national healthcare policy run by government. And Canada? Although the Hospital Insurance and Diagnostic Services Act (HIDS) was passed in 1957, it wasn’t until 1966 that Lester Pearson’s government passed the Medical Care Act that Canada joined the party a year after the US. In 1984 the two acts were consolidated into the Canada Health Act, with Canada’s Federal government setting the requirements and provincial governments implementing their own health care plans according to the federally mandated standards. Who was first? The idea seems to have been seriously considered first in America, while the overall implementation occurred fairly simultaneously in both countries in the mid ‘60s. So, Myth #3 is doubtful at best, although the United State’s Medicare and Medicaid programs are far from being the universal single-payer healthcare system that has prevailed in Canada for 50 years now. Not necessarily. And that doesn’t just mean Canadians who migrate south to further their careers or because they went to university in the U.S. At one point, Canada was in danger of a population collapse in the early years of Confederation because of mass migration to the USA. According to historian Robert Bothwell, around 825,000 Canadians headed south across the border between 1870 and 1890. Canada’s total population was about 4.8 million at the time. That means Canada lost about 20% of its residents over 20 years. That would be like 7 million Canadians packing up and heading south between 1998 and 2018. While America was indeed in its so-called gilded age in the late 19th century, with the reconstruction of the country after the Civil War clearly a major factor, the fact that nearly 1 in 5 Canadians gave up on Canada shows how powerful the pull of the U.S. was to the young Dominion. That means that Myth #4 is often – if not always – false, even if many Canadians nowadays do prefer to stay in their home country. What is the Difference Between a Certificate of Identity and a Refugee Travel Document? Until they get a better job in the USA. Actually, sometimes myth is based on fact. This story is likely true, given the newspaper accounts of the event at the time. In Montreal, an engineer named James Creighton decided to rent the ice at the Victoria Skating Rink on a Sunday for a game of hockey for his rugby playing friends. Hockey in those days was a game which at that time was played outdoors on frozen ponds, often chasing road apples – frozen horse turds along the ice. It’s also the name of a Tragically Hip album, a band that knew their hockey and their history. So, on March 3, 1875 the first indoor game of hockey was played. The Victoria Skating Club demanding the hockey players clear the ice. Which they did with a few bruised shins and broken benches. Hence a legendary tradition of settling personal scores on the ice like a drunken Scottish Engineer in an Irish Pub began nearly 99 years before Bachman Turner Overdrive released Not Fragile in September of 1974. Absolutely true. Myth #5 is a legend! A definite maybe. James Naismith did indeed create the original rules for basketball for the YMCA in Boston, although it is said he preferred rugby. But the game of basketball flourished and developed in America with Americans taking the lead as the game spread worldwide. Football evolved from various sports that pitted young men in teams against each other with some sort of ball usually involved. A key event in North American football’s evolution was indeed a series played between Harvard and McGill in May of 1874 in Cambridge, Massachusetts. A different set of rules were used for each of the two games and McGill’s rules were apparently closer to those of the modern game. From the initial encounter, the game spread to Yale and Princeton, and McGill would continue to play against its Ivy League neighbours to the south for a number of years until the Canadian game went its own way with a slightly different set of rules than those for American football. You do know the difference between the two sets of rules, don’t you? Maybe you don’t. The CFL has an aging and shrinking fan base with the problem particularly noticeable in cities like Toronto, Montreal and Vancouver. While Major League Soccer has a young and growing fan base. Toronto FC cleans up versus the Argos when it comes to attendance at their now-shared BMO Field, for example. Millennials seems to prefer the original football over the game with 12 players a side, a longer and wider field, and only 3 downs. And baseball has been played in some form or other since at least the 1700s. In 1791, Pittsfield Massachusetts passed a bylaw forbidding the playing of “Baseball” due to broken windows. So, the fact that Beachville, Ontario likes to consider itself the home of the first recorded baseball game back in 1838 gives Canada a place in the game’s history, but hardly bragging rights over who invented the game. And yes, a Canadian wrote the classic baseball novel and Hollywood blockbuster, Field of Dreams. Did Canada invent all those games? Not really. Has Canada been a part of those games for a couple of centuries now? Absolutely. Answer? None of them. Where did they earn fame and fortune? Mostly in the USA. So, if Canada and Canadians are so funny, why didn’t they stay at home? Myth #7 is definitely true, and worth millions to any Hollywood producer worth her (or his) salt. Do you agree? Let us know, and if you have some myths to be debunked, comment below!